Don't really know how these stove contests work but I wanted to share my latest design. The Fancee Feest has been my favorite alky stove for a while (thanks Zelph) but I've been wanting a version that doesn't have a built in pot stand. I usually prefer the stability of a Caldera Cone or hardware cloth stand. Introducing the FF Stubby. It's made with the same raw materials as the Fancee Feest (Fancy Feast cat food can, aluminum bottle, fiberglass cloth) but instead of using a tubular section cut from the aluminum bottle it uses the bottom. So it's an inverted bottom section of aluminum bottle inserted into the Fancy Feast can with fiberglass cloth sandwiched in between. Five fill holes are drilled into the center of the bottle's bottom and a sixth vent hole on the bottom's outer edge. The vent hole allows air to escape when adding fuel. Without it the alky tried to go down while the air was coming up out of the same holes and it was a standoff. I was able to boil 16oz of 40F water in 40F air in 6 minutes and the stove flamed out after a little more than 9 minutes. Used a 3" hardware cloth pot stand. Using a 2" stand pushed the boil time to over 9 minutes (not good). 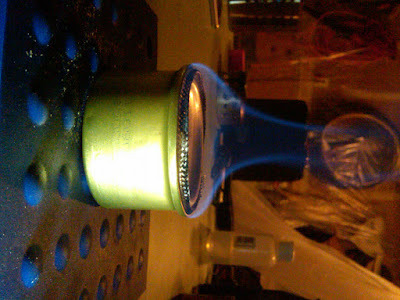 It was 1oz of SLX denatured alcohol and the stove to pot distance was 1.5". Based the distance on what works best with a Trangia, even though this is a very different stove. The alum. bottle fits just right, lots of posibilities there. Have you tried it inside a caldera windscreen? Haven't tried it in the Caldera yet but that was my motivation for building this stove. Will report on the results after I do a Caldera test. I wasn't going for originality with the FF Stubby. Just wanted to adapt an already successful product to a different application. How much fuel to get a boil? Is the inverted bottle full height of the stove? Inverted bottle is flush with the edge of the catfood can. Wick is about 1/8" high but since it first become visible in the valley between the two cans it doesn't actually stick up a full 1/8" over the top. The FF Stubby is turning out to be a pretty versatile and efficient stove. I wanted to see if I could boil 1 quart of water with 1.5oz of fuel. The water was from the faucet, the air was 30F and the pot was a 1.5l GSI Dualist. To my surprise the water was boiling in 9min 25s and flamed out at 14min. Assuming a constant burn (reasonably fair assumption for wick stove) the math says the stove used just 1oz of fuel to boil 1qt. Woo hoo! Fast and efficient.